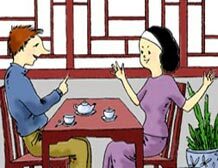 lì li: nĭ shì xué shén me zhuān yè de? mài kè: wŏ shì zhuān mén lái zhōng guó xué xí hàn yŭ de. Mike: I come to China just to study Chinese. lì li: nĭ zài năr xué xí? Lili: Where are you studying now? mài kè: wŏ zài bĕi jīng yŭ yán wén huà dà xué xué xí. Mike: At the Beijing Language and Culture University. lì li: nĭ xué xí jĭ nián le? Lili: How many years have you studied? mài kè: yĭ jīng sān nián le, hái chà yī nián jiù bì yè le. Mike: I’ve already studied for three years. I’ll graduate in a year. lì li: bì yè yĭ hòu huí guó ma? Lili: Are you going back to your country after graduation? mài kè: shì de, wŏ yào huí qù gōng zuò. Mike: Yes, I’ll return to my country and find a job. lì li: huí guó zhăo gōng zuò kùn nán ma? Lili: Is it difficult to find a job? mài kè: bú tài kùn nán, yīn wéi wŏ de guó jiā dŏng hàn yŭ de rén bú tài duō. Mike: Not very difficult, because there are not so many people in my country who know Chinese. lì li: zhù nĭ hăo yùn. Lili: Whish you good luck. Sometimes among friends, especially among those who have the same aspirations and interests, a periodical talk is held and it’s somewhat an academic discussion. A periodical talk is usually prearranged and requires some preparations. People would talk about a certain aspect of work and study so as to exchange thoughts and share common ideas.